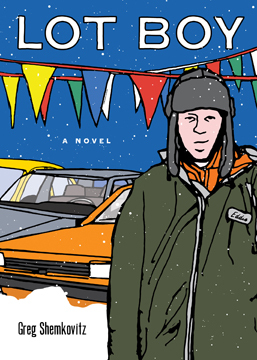 Eddie Lanning, the titular character of Lot Boy, Greg Shemkovitz’s debut novel, is a slacker doing menial work at his father’s car dealership. He spends most of his time verbally brawling with the mechanics, shirking his responsibilities, and ranting against his lot in life. Another dealership reprobate, Spanky, convinces Eddie to step up his amateur stolen parts operation.